Light breezes flowed through the open windows at Trinity Church in Crimora, carrying the scent of cows grazing in pastures beyond the building and graveyard. Last Wednesday evening’s service capped this summer’s mid-week Serenity At Trinity series. 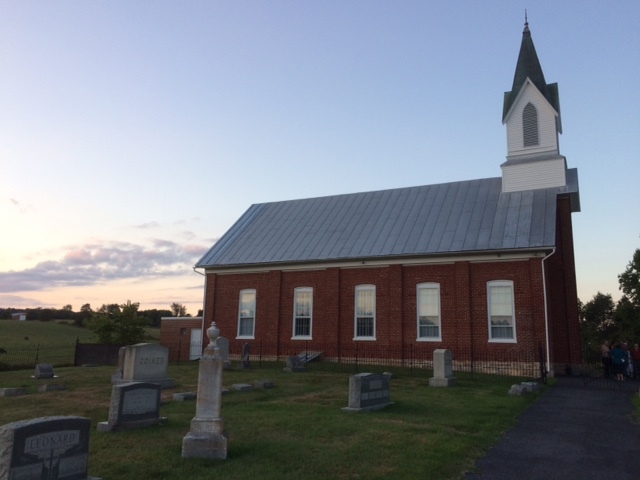 Two former churches had been built on this land in the Shenandoah Valley. The first was a cabin dating from the late 18th century, and the second a brick church completed in 1838. When the congregation deemed the second building beyond repair in 1880, they voted to build a new brick church adjacent to the graveyard. The building shown in the photograph I took that evening includes the turn-of-the-century expansion. After scripture reading, devotion, and hymn sing to celebrate the Reformation’s 500th anniversary, Pastor Tim Bohlmann asked for prayer requests. He wrote down and prayed several: praises for those recovering health, prayers for those struggling with illness and death, a request for peace in Charlottesville on Saturday. Demonstrators and protesters were descending on the city. While volunteering at WriterHouse in Charlottesville on Friday, I prayed for calmness, cool temperatures, and much-needed rain. But that’s not what happened. Saturday brought news of hot tempers and unrest. A young man rammed a car into a crowd, killing a young woman and injuring several other people. Later, two law enforcement officers died when their helicopter went down outside the city. Sunday morning, our congregation gathered in Waynesboro, the church’s place of worship for the past 94 years. In 1874, a church had been built on Bethany Hill for those who lived in town. Then in 1923 the Trinity congregation made a decision: to maintain the site in Crimora, tear down the fifty-year-old decrepit building on Bethany Hill, build a new church in Waynesboro then move the entire congregation there. There on Sunday, Pastor Tim led us in prayer. We prayed for those recovering their health, for those needing strength to face illness, for our families, and again for Charlottesville—for the woman who died, for the injured, for the police officers, for their families. For healing. Yesterday afternoon, the congregation of Bethany Lutheran Church met in the middle of a farm field in Fishersville to break ground for a new building. This change has been ten years in the planning. Our beautiful 94-year-old building needs extensive renovation; the location is no longer central to the community it serves; the congregation and school have outgrown the building and the site. The decision to relocate has not been without controversy, not without anger, not without fear. For the most part, the response has been patience, respect, kindness, and understanding. I imagine the same happened with past building changes. Spiritual meaning, that’s the change I want to build, not the lack or illusion of authenticity, not anger or fear, not ego-driven autonomy. Faith. Openness to God’s love and forgiveness. That’s my prayer for us. That’s my prayer for families. That’s my prayer for churches. That’s my prayer for our communities.